Playwrite: Zafehouse: Diaries is alive! After ten months of development, we decided it was time to reveal Zafehouse: Diaries, the debut game from Screwfly Studios. It’s the spiritual successor to Zafehouse, a game I made in seven days about five years ago. Since then, I’ve been tinkering at creating a sequel to encompass much more of the zombie apocalypse experience. Two prototypes were created over the last couple of years, until I finally landed on something I felt could work. 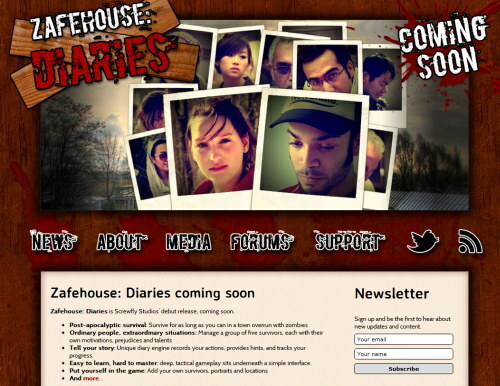 Zafehouse: Diaries is our take on what a zombie game should be. We don’t think other titles have really captured what the genre is about — the survivors. In Zafehouse: Diaries, you’re just as likely to lose the game from being eaten alive as you are from bad relationships developing amongst the members your group. While barricading, gathering supplies and making sure you have enough to eat is important, you must also be mindful of your survivors’ prejudices and how they feel about each other. Survivors aren’t just automatons designed to do your bidding. They’ll play cards games or Chess, tinker with equipment and perform many other tasks without your input. Whether they develop comradery, or descend into a squabbling pack of madness depends on your leadership skills and strategic abilities. If you’d like to learn more (and you do! ), head over to the official site and read all about it. ~ by Logan on June 11, 2012.